Published Dec 19, 2011 by Peachpit Press. Part of the Learn by Video series. 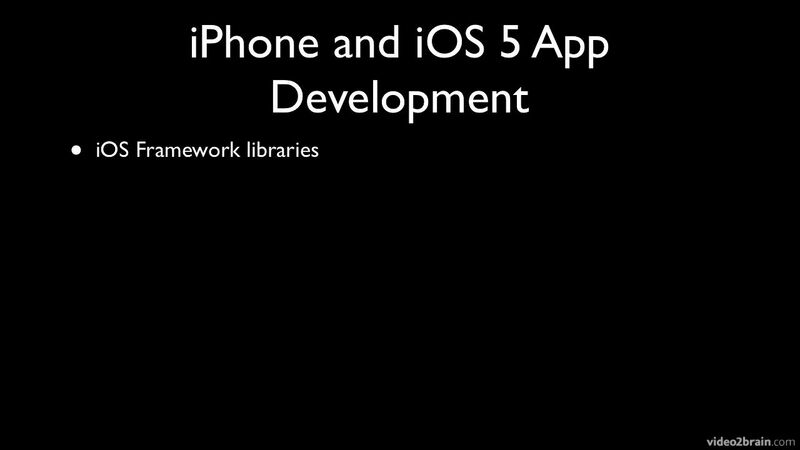 This focused workshop provides 4 hours of high-quality video training on advanced iPhone and iOS 5 App development presented by expert iOS developer Robert Turrall. Robert will guide you through the more advanced iOS Application Development topics including multithreading and performance issues, adding Twitter Integration to Applications. Other recent additions to the CocoaTouch Framework for iOS5 will also be covered. Starting with a short overview of each of the areas to be covered, the video will take you through the process of creating targeted applications aimed at illustrating the use of each of the Frameworks covered — giving you a solid grounding in the subject matter and finished application code examples that can be reused in their own projects. The exceptional quality video tutorials, come complete with lesson files and a booklet. The lessons are wrapped in a unique interface that allows the viewer to jump to any topic at any time. Full-Screen mode provides a hi-def, immersive experience, and Watch-and-Work mode shrinks the video into a small window so you can play the videos alongside your application.